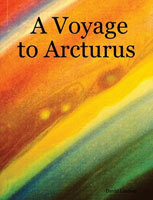 A Voyage to Arcturus is released as an audio book! ... But all too quickly, the excitement's over: the reader, "AudioBookHouse's David", turns out to be a computer, and the "audio book" is what you get by loading up Project Gutenberg's A Voyage to Arcturus text file and getting your computer to speak it. Oh well. This travesty comes courtesy of Lulu.com, the Print-on-Demand publishing service, where you can also find several print editions of A Voyage to Arcturus. I've no problem with this, particularly if, as with the case of Black Cat Press, they go to the bother of producing a good cover. It keeps Lindsay's work in print, after all. But there's another dimension to Print-on-Demand: you can quite easily produce your own version of the book, with your favourite font at the size you find easiest to read, in hardback or paperback, with your own cover design.